ILYA | What Does ILYA Mean? ILYA means "I Love You All". The phrase "I Love You All" is often used by celebrities and politicians when addressing an adoring crowd. To their fans and supporters, it may be exactly what they want to hear, but to the non-partisan observer, the phrase sounds like insincere hyperbole. In the digital world, the abbreviation ILYA may be used as a farewell when a user leaves a group or forum, particularly in the USA. Of note, ILYA should not be confused with the abbreviation LYA. Celebrity: Thank you for being here tonight. ILYA. Adoring Crowd: We love you! Forum member: Gotta go. See you tomorrow. ILYA. 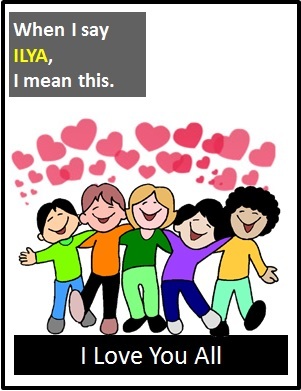 ILYA is normally used as a standalone declarative sentence (i.e., a statement). In other words, ILYA is not normally used as another part of speech within a wider sentence. Before the digital era, we would have said "I Love You All" instead of using the abbreviation ILYA, just as we would in direct speech now.